The UK charity groups OcuMel UK and CLIC Sargent will be accepting donations from this year's Eye Smart Campaign. 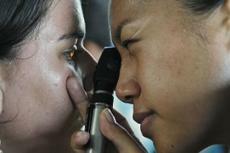 The two charities hope to encourage more UK residents to get regular eye screenings so doctors can catch life-threatening diseases as early as possible. In particular, the Eye Smart Campaign will highlight how a routine eye examination could detect warning signs for ocular melanoma. The Eye Smart Campaign began on June 22nd, 2017, with the help of the Wardale Williams practice and Observatory the Opticians. Two of Wardale Williams's patients were diagnosed with early stages of cancer shortly after a routine eye exam. Ralph McMurray, a retired police officer, was the first of these two patients. Believe it or not, McMurray had his first ever eye exam at the age of 66. Fortunately, McMurray's ophthalmologist spotted the early warning signs of this eye cancer. Unfortunately, McMurray had to have one eye permanently removed. Eye doctors at Wardale Williams discovered the second patient, Keira Dixon, had a brain tumor just from a routine eye exam. Immediately after they made this discovery in 2015, the doctors referred Keira Dixon to a hospital to have surgery. Dixon is still recovering from this life-threatening condition. Both Ralph McMurray and Keira Dixon's families are supporting the Eye Smart Campaign. Family members hope that these stories will remind UK residents just how important eye exams are for the detection of various diseases. Jo Gumbs, OcuMel UK's operations manager, said he hopes the Eye Smart Campaign will encourage more people to get yearly eye screenings. With specific reference to ocular melanoma, Gumbs told reporters, "We hope people will take notice of the vital messages which will be highly publicized throughout the Eye Smart Campaign." Complimentary literature on the latest innovations in eye care will be available at all Wardale Williams practices during the Eye Smart Campaign. There will also be various fundraising events throughout the campaign. Just a few of the locations Wardale Williams practices are located in include Halstead, Sudbury, Ipswich, and Muswell Hill. Ocular melanoma (sometimes called "uveal melanoma of the eye") is a rare eye disease that negatively affects the pigment cells in the eyes. Although it is rare, ocular melanoma is the most common eye cancer in people over the age of 60. There are 600 new cases of ocular melanoma in the UK each year. OcuMel UK is a national charity dedicated to helping people affected by ocular melanoma. The organization has a toll-free hotline anyone can use at 0300 790 0512, as well as Facebook and Twitter pages. CLIC Sargent was founded in 2005 after the groups Cancer and Leukemia in Childhood merged with Sargent Cancer Care for Children. The charity group is dedicated to helping children affected by cancer. While CLIC is headquartered in London, the charity group also has offices in Belfast, Glasgow, and Bristol. Anyone can find out more information about this campaign at the website https://www.eyesmartcampaign.co.uk. There's a ton of useful information the importance of eye exams under the tab "Are You Eye Smart?"